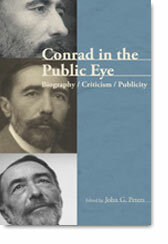 Conrad in the Public Eye: Biography / Criticism / Publicity, edited by John G. Peters. Amsterdam: Editions Rodopi, €57/$75. 275 pp. If you bother to read this review, I should politely urge you to remember one thing: not an academic, I read Conrad for sheer enjoyment as well as pure enlightenment, and I read around him in exactly the same way, almost more so. When scholarship seems to stray from such entertaining enlightenment, things go awry: which explains my being slightly catty in what follows, though not about the book in purview. Let me state straightaway, without sounding like a sad sycophant, there has been excellence in most of the Conrad scholarship recently published for the academic audience as well as the likes of me – partly due to Cambridge University Press but, above all, to Rodopi and The Conradian. Cambridge has managed the publication of the final volumes of the Conrad’s correspondence in tandem with the publication of new editions of his works and, in September 2009, the publication ofJoseph Conrad in Context edited by Allan H. Simmons. With so much going on in the Conradian world (to say nothing of other authors, other presses) it seems almost indecent that John Peters’ new book can be welcomed with such warmth. But it can. The possibility of this book ten or eleven years ago would have seemed a van Marlean dream. The fact it joins a burgeoning "Conrad Studies" series overseen by Simmons and J. H. Stape and published by Rodopi is magnificent. The late Martin Ray’s volume Joseph Conrad: Memories and Impressions: A Bibliography (Rodopi, 2007) kicked "Conrad Studies" off. This volume is the second to appear. John Peters’s stated purpose is “to provide access to a number of brief and relatively brief publications that are difficult or nearly impossible to obtain.” So far, so good – and what is good is excellent. His book more than matches Ray’s and – having read the third in the series, "My Dear Friend": Further Letters to and about Joseph Conrad, edited by Owen Knowles – provides precisely what it says on the tin: old material, often difficult of access and widely scattered in archives, newly presented. Peters divides his research into four sections: Biography; Appreciations; Early Criticism and Publicity and has collected some terrific material for each of his sections – of note are a talk about Conrad given by Hugh Clifford in Ceylon in 1927 and Florence Doubleday’s skittish memories of Conrad’s visit to America, as well as James Whitaker’s account of Conrad in Stanford-le-Hope between 1896 and 1898. The last third of the book is centred on publicity material providing fascinating, if slightly repetitive, glimpses as to how Conrad was presented to his reading public. Peters has gathered material from Doubleday, Dent. and Unwin and offers a useful collage of advertisements, jacket copy, biographical sketches, and other promotional matter, helpfully annotated. In a world where a forthcoming conference is soon to host a paper comparing Conrad’s and Henry James’s place in contemporary cultural tourism in Kent [sic], publications like Conrad in the Public Eye are manna from some sort of seventh heaven. There is here serious scholarship and thought apparent in this splendid anthology. Needless to say, there are some tiny slips, the most entertaining being the fact that J. B. Pinker could not have accompanied Conrad to New York in 1923 having died the year before (46). The error is Mrs Doubleday’s, but it is underlined by a careless footnote. I’d have happily seen much of the material in Peters’s first section (Biography) included in the earlier compilation by Martin Ray (Memories and Impressions) that I mentioned earlier. That is a minor cavil, perhaps a personal, wrong-headed desire, but the fact that this did not, has not and cannot happen certainly should not prevent Conrad in the Public Eye from being an essential addition to any college or university library. I am delighted to have it on my shelf, and am happier still to know now its use and validity to any reader mad enough to explore stuff about Conrad for longer than an hour and a half.